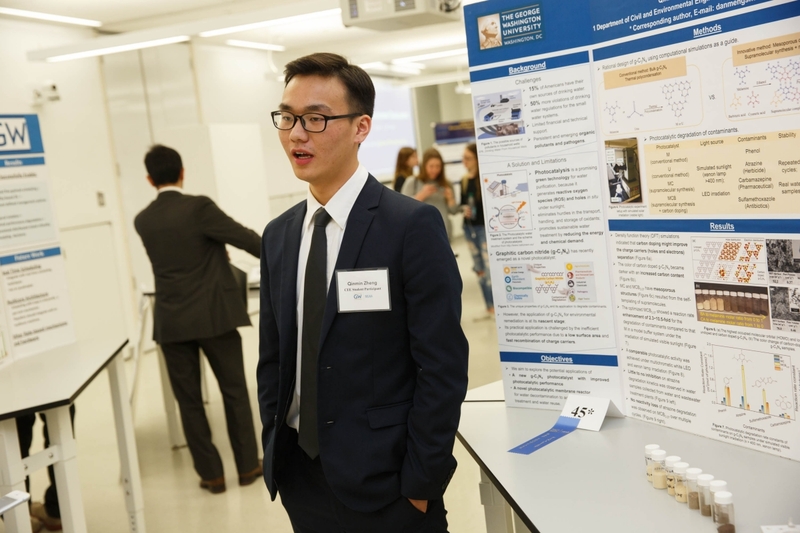 Students vied for $50,000 in prizes during the School of Engineering and Applied Science's annual Student Research and Development Showcase Wednesday. Undergraduate and graduate students displayed 116 posters in Science and Engineering Hall highlighting months and years of research and collaboration leading up to the 11th annual event. Judges evaluated the posters during two judging rounds on Wednesday, and the showcase was open for public viewing in the afternoon. This year’s showcase also included an Entrepreneurship Prize Competition and the poster and prototype presentation phase of the new SEAS Innovation Challenge. Manny Rivera, founder and owner of RiVidium Inc., the Platinum Sponsor of the Showcase and a Virginia-based company focused on software and cyber security, said during his keynote address that students need to stay curious and dream big to tackle the problems of tomorrow. Mr. Rivera, M.S. ’05, said he has seen the R&D Showcase grow significantly since he was a judge in its early years. The future is in good hands with GW students at the helm, he said. “I’m thankful every day for the opportunity to have studied at SEAS,” he said. Nima Mobadersany, a mechanical and aerospace engineering graduate student, won the top prize of $5,000 in the theoretical poster category for his project titled “Perforation of cell membranes using contrast agent microbubbles in the presence of ultrasound.” He was mentored by Professor Kausik Sarkar. Elizabeth Manning, a civil and environmental engineering graduate student, was awarded $5,000 in the experimental poster category for her project titled “The role of viscosity in mesophilic anaerobic digestion.” She was mentored by Professor Rumana Riffat. The $2,000 AgileTrailblazers Innovation Award, geared at innovative projects with potential commercial value, was awarded to Connor Roberts, an engineering management and systems engineering graduate student, for his project titled “Internet of Things device for a safer, more efficient medical asset management system.” The award provided is by Naeem Hussein, M.S, ‘99. Nada Kamona, a junior majoring in biomedical engineering, presented research that suggests doctors could use strong infrared cameras to detect tumors in breast tissue. Tumors typically require more blood flow than healthy cells, Ms. Kamona said. If a patient has a tumor he or she is likely to have a slightly higher local temperature in the region of the tumor. Ms. Kamona and SEAS Professor Murray Loew have been able to detect slight temperature changes in patients diagnosed with breast cancer using a strong infrared imager, the N2 Imager camera. The camera captures infrared images over a 15-minute interval while the patients sit still and their body temperature cools. This detection method is safe and non-invasive, Ms. Kamona said. The lab is collecting data through clinical trials and also plans to develop software to detect the changes in infrared images to eliminate human error. A group of five master’s students and two undergraduates developed software for a small robot designed to help patients stick to a therapy plan after shoulder surgery. Scott Downen, a master’s student studying biomedical engineering, said shoulder surgery recovery typically takes six months, but 75 percent of patients do not follow their prescribed programs at home. This delays recovery and adds to medical costs. The software programs the robots to wake up once a day to walk a patient through specific prescribed arm movements. The robot can track patients’ movements and provide feedback on their progress. If they slack on their physical therapy, the robot will know. “If [the patient] said they prefer positive feedback but they aren’t doing well, it will start saying things like ‘I don’t want to have to call your physician,’ and ‘You’re family is counting on you to get better,’” Mr. Downen said. The student researchers have been able to program the robot to track five different arm movements. The next step, Mr. Downen said, is to find a physician or practice to partner with to determine what types of therapeutic movements are the most beneficial. This will allow them to collect data to determine if the robots get more people to follow prescribed therapy at home. There is plenty of data tracking how viruses spread globally due to air travel, but travel-related dissemination is often overlooked on a city scale, said Edna Aguilar, a junior majoring in civil engineering with a concentration in transportation. Ms. Aguilar studied how public transportation use, local temperatures and influenza were interconnected in Chicago, Boston, Washington, D.C., and Columbus, Ohio. She studied four years of data and found a negative correlation between transit ridership and influenza activity. When transit ridership decreases, influenza activity increases, she said. Ms. Aguilar does her research under Samer Hamdar, a SEAS associate professor. A record number of student engineers participate in ninth annual showcase.